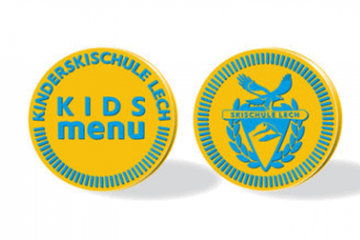 LECH KID’S SKI SCHOOL – LEARNING WITH OUR MASCOT »PFIFF«. Here at Lech Ski School we have a special place in our hearts for our youngest skiers. In our exclusive Kinderland children aged from 41/2 are cared for in a safe and entertaining environment where they will develop a desire to ski and enjoy the snow. Special learning aids and children’s programmes help mini-skiers and newbies to learn to ski here. Lech Ski School’s Kinderland is an exclusive area reserved only for those taking courses with us. With teaching methods that are sensible and at the same time enjoyable, skiing becomes child’s play here. Each child is seen as an individual and receives special attention. Our ski instructors will pull out all the stops and draw on deep reserves of empathy and sensitivity to make sure your child is happy and comfortable at Kinderland. Mastering the necessary techniques is a must for those who want to get the most fun out of skiing. Our children’s courses include an appropriate instructional programme for every ability level – from the first moments on the piste to faster and more challenging terrain for the more experienced kids. As soon as the pistes can be navigated safely our kid’s groups head out to explore the resort while perfecting their skills with training programmes specifically designed for that purpose. Naturally our kid’s programmes are not limited to ski instruction. During the lunch break the kids get the best of care sharing lunch with their instructor. The full day care includes boundless fun and entertainment for your child, and complete independence for you. Children learn best in groups where they can motivate each other. Under our motto “Teamwork makes it easier” the kids will join forces and learn together. There is no question that skiing and playing in the snow is far more fun in a group! This is why our instructors take the best care of our youngest skiers from Sunday through till Friday from 10 a.m. till 3 p.m. We offer lunch tokens to ensure a stress free and fun lunch together with the whole group. In our group courses individual attention is payed to each child’s abilities. Playful techniques and programmes specifically designed for children ensure rapid progress. The top priority is always having fun together and staying safe, while along the way forming great friendships! Straight descent (Schuss) / snow plouw / turns / stopping with snow plouw / using t-bar. Reduction of the use of the snow plouw technique up to parallel skiing / changing directions at controlled speeds in easy terrain / using lifts. Rhythmical descent with short and long radii / dynamic change of direction / mogul slope. Refining and automation of skiing techniques / sporty-dynamic descent on slopes of all gradients / mogul slope / slalom / freestyle. Please speak to one of the instructors at the meeting point regarding group allocation. The BLUE, RED and YELLOW flags in the centre of the meeting point can serve as a general guide. In each section several instructors for each ability level (see Ability Based Groups) will be waiting. They will be able to place the children in the most suitable group based on answers to questions about skiing ability and the number of “weeks skiing”. Reassignment is possible at any time during the first day of skiing after the completion of the first technical exercises. Group allocation takes place at the meeting point from 9.20 to 9.45 a.m. Please note the new meeting point location next to the Oberlech Gondola, along the river in the village centre. • Early bird groups: 9.20 to 9.35 a.m.
• All other groups: 9.30 to 9.45 a.m.
Sunday – Friday, minimum of 4 hours per day. Advanced learners can start on any day (except Saturday). Courses for beginners start on Sundays and Mondays. All children require a valid lift pass! Lunch is eaten with their ski instructor during the lunch break (not included in course price). Start of course​: All groups (except early bird) 10.00 a.m.
Start of course: Early bird 9.40 a.m.
An exclusive experience with highly motivated ski instructors for children who are extremely enthusiastic about our sport. Small groups (max. 5) ensure that each child will receive individual guidance. Early bird groups enjoy undisturbed lessons every morning. They are the first to enter Kinderland and the first to access the lifts. Every child receives an achievement certificate and a souvenir (at no extra charge) at the end of the week. Parents benefit from continuous feedback, keeping them constantly informed about their child's progress. Racing like the top skiers: The exciting atmosphere of a race takes shape every Thursday or Friday as the groups of the Kid’s Ski School get ready to race. Everyone gets the opportunity to show what they can do and what they have learned during the week. Everyone has a reason to celebrate at the awards ceremony at the children’s meeting point as we believe every child is a champion and receives a medal. At the children’s meeting point on race day at 2.45 p.m.
At Lech Ski School every child is a winner and receives a beautiful medal! Mmmm … that tastes good! Everyone knows skiing works up an appetite. Even as the day is beginning the kids are already looking forward to picking something tasty from the Kid's Menu. Using their own tokens to pay for lunch is not only fun, but also child appropriate and safe. Tokens can be purchased at the Lech Ski School office along with instructions if needed. A child can pay for one lunch (1 meal & 1 beverage) at the ski school’s partner restaurants to a value of €13. The instructors simply collect the tokens after the meal so that the lunch break runs smoothly without unnecessary waiting time. Children then return to the pistes relaxed and with their energy replenished. Lost tokens cannot be replaced. No cash refunds are issued for unused tokens. * The content of the Kids’ Menu is determined by the restaurants in question.. Please note that all children need a valid lift pass to use our ski lifts. The Snowman ticket is offered for € 10 (plus € 5 deposit for the Arlberg chip card) for children born in 2011 or later. A photo is required for the Snowman ticket: it will be taken at the ticket office. Ticket holders of the Snowman ticket are entitled to unlimited use of all lifts and cableways for the entire season. Please purchase a valid lift pass for your little “Snowman” at one of the ticket offices before the ski lessons start (ID required). The parent/guardian acknowledges that the children are supervised by trained ski instructors who take utmost care to avoid accidents or injuries while teaching the children how to ski. However, absolute safety cannot be guaranteed. We therefore explicitly point out that participation is at one’s own risk and that the instructors assume liability only for damages or injuries caused intentionally or caused by gross negligence. Lech Ski School reserves the right to exclude from further participation any children whose behaviour repeatedly disrupts the service provided, with no reimbursement of the participation fee. The General Terms and Conditions displayed in the office of the ski school apply.